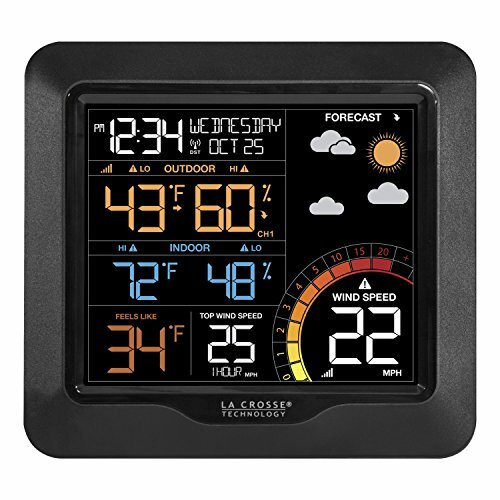 This La Crosse wind speed weather station, the La Crosse Technology 327-1417 provides top things I look for. The first thing is the I just love being able to capture wind speed. I think most of us are keenly interested in the wind. Maybe your interest is one of not liking very windy weather. Mine is, I really like it windy. When it’s windy I find all of the weather readings we look at become much more active and interesting. Also as I studied this model, I believe wholeheartedly that this is a great entry level wind station for the more interested weather students. This station provides a nice selection for a gift or even a really solid choice for a first-time weather station purchase. A really good first-time weather station for someone. Here are some reasons I feel that a La Crosse wind speed station is a great choice. As I see it, this home weather station with wind speed has many top features that you will want on your personal weather station in 2019. You will be able to get updated wind speed 24 hours a day. When the weather is very windy, many different things can be happening. So you can set up a high wind alert. If you have things that need to be protected during high winds, like preventing garbage cans from blowing away. Or maybe you have a large tree beside your driveway, maybe you need to move your automobile to protect it. It could also mean you have some extreme weather approaching where you live. Time to seek shelter. As you grow in your experience with the weather station with wind speed, you will become more enthralled by the weather changes, and you will pick up on weather patterns. From this growth, you will probably be able to actually start predicting some weather conditions that will happen. As you do this, you are protecting your property better, as well as your family from any weather cause harm. The wind speed is being updated every 30 seconds and for history is stored for a rolling 24-hrs at a time. During your time period of the last day you will know what your maximum wind speed was and always what the wind is currently. This is much more fun than a simple wireless color weather station. It’s simply more than calendar readings, and temperature and relative humidity. You will have access to your current temperature 24/7 as well. The screen is a brilliantly and boldly colored screen which shows the featured information in an easily read fashion. It provides you with all current calendar information as well as it will provide your correct time from the 7 USA time zones that are programmed into it’s normal operation. It has wireless transmission at 433MHz. it should be good with reception up to 330 feet away. The type of instruments available for data collection are, a relative humidity sensor, a thermometer, an anemometer, and it also, will give you an updated 12-24 hour forecast, using icons to depict the upcoming conditions. Here is the description of the two sensor units that come included in this La Crosse wind speed weather station. Every 58 seconds it updates the temperature on your display unit. and it also uses the TX144W Wind Speed Sensor this wind sensor has a range of reading from 0-111 miles per hour that are recorded and transmitted. This sensor updates itself every 30 seconds during the 24/7 cycle. All Batteries are Not Included. A word to the wise. The batteries for the two outdoor sensors should be Lithium batteries. Lithium batteries provide a much longer shelf life than the regular alkaline batteries will. The display unit is a nice bright clear colored screen. This makes it both a colorful addition to your room as well as it makes it much easier to read and see. It has a high, low and off switch for lighting. But please note the backlight only works with the unit plugged into your electric power source. It will work manually with batteries only power, by pressing the setting switch. On the display screen, as we go clockwise around it, you will have the weather forecast depicted with colorful icons. then next you will see a large circle fashioned wind speed (like a dial) is featured on the screen. This is truly a wind weather station. La Crosse makes a few of these mid-ranged home weather station with wind speed, where the wind speed is highlighted on the screen. This is a really good wind speed weather station. A serious contender in the midrange priced home weather stations, a value-priced weather station. Then you will have listed the top wind speed in the last 24 hours. Then we have the “feels like outdoor temperature” listed currently. Then it will show you the indoor temperature, and relative humidity. As we continue around the clock the last readings shown are the outdoor temperature and the current RH Humidity. Then between 11-12 o’clock is the current time AM/Pm Date and day of the week. Basically all of the updated calendar functions. The screen is color-coded by colors to separate with your vision, as an example, all outdoor readings are one color as featured. When you buy this weather station you may also be interested in protecting your sensor unit by buying and enclosing the Temp/RH sensor in this sensor shield. Protect your equipment from the outdoor elements. This is a great add on item for a La Crosse Sensor wind speed sensor. This protector shield measures 7.00 H x 3.73 W x 3.98 D inches. It is meant to protect most La Crosse TX sensors. That will include the TX141TH-BCH Temperature and Humidity Sensor also known as a thermo-hygro sensor. It comes with 4 metal mounting screws to mount to most flat surfaces whether vertical or horizontal surfaces. ✅ It has weather trending arrows on the Forecast area of the display. This will tell you, your weather is trending towards a sunny day, etc. As I wrote this review about a wind speed weather station, I realized a few things I would like to share. The first thing is that I thought that wind speed and wind direction are cornerstones of weather forecasts, and weather changes. You will not be that aware of this at first but as you use this La Crosse weather station with wind speed, you will soon know these two things to be true. While this La Crosse wind speed weather station does not provide wind direction for you. Not to worry, you will pick up on wind direction patterns in your locality. 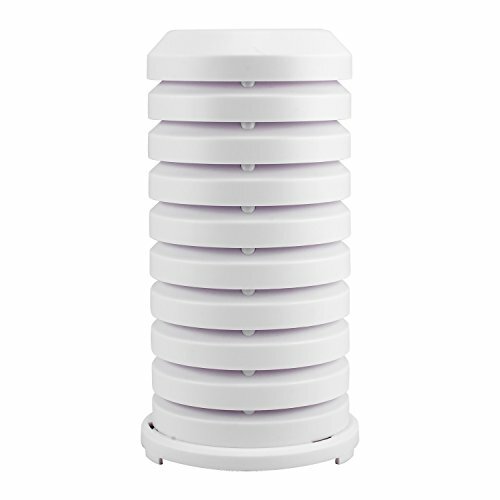 Keeping these things in mind made me realize why a home wind speed weather station has a place in the homes of many people. This model from La Crosse the 327-1417 is perfectly priced for the consumer as I figured in the reliability and accuracy of the weather readings. The quality is there for many years of use. So what do you have? You have many really cool features presented to you in a wireless colored home weather station. You can set it up at your home, and you can enjoy and put to good use all of the weather data it is presenting to you 24/7. You can have a safer, and better planned out life using your very own home weather station. A great purchase at a great price. Check out the Amazon price now. Just Click Here Now to see the La Crosse 327-1417. My interest in a La Crosse wind speed weather station is actually two-fold. First I find wind speed is one of the more fun readings in owning a weather station. Secondly, as I did the review that fact that you may have an anemometer with the unit at this price was very interesting to me.